Isaiah Likely, a 6-2 225 pound WR/Athlete from Malden, MA has Tweeted he's received an offer from UMass. Inside the Huddle has a post about Likely. Besides UMass, Likely has an FBS offer from Southern Mississippi. Watch the joy in the UMass locker room after the win. Matty Vautour reports Mississippi State is ranked this week as #21 in the AP Poll. Sports Illustrated has the Bulldogs at #22. The Clarion-Ledger wonders what bowl the Bulldogs will play in. State does it with the running game and defense. Mike Traini of "Fight Massachusetts" has a Q&A with a Mississippi State fan site. The Vegas Line has come in with State as a 28 point favorite. Keepers college football ratings has the Bulldogs by 44. UMass' win over Appalachian State didn't do much for the Minutemen's power rankings as Keeper's has us a #123. The Starkville Daily news reports Dan Mullen is thinking about UMass, not Florida. 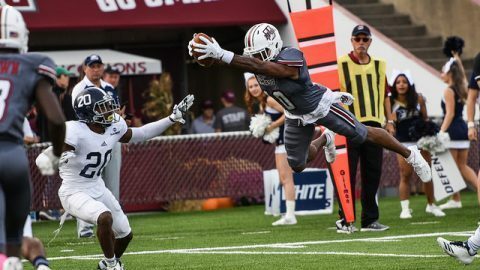 "UMass will also enter Saturday’s game with confidence after winning its last two games, giving Mullen and the Bulldogs greater reason to remain focused. The Daily Journal says UMass' record is misleading. 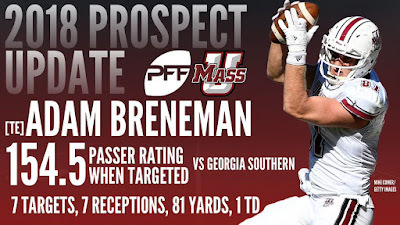 The Associated Press says Adam Breneman can make the case for being the best TE in the country. Meanwhile, the injuries keep piling up for BYU. 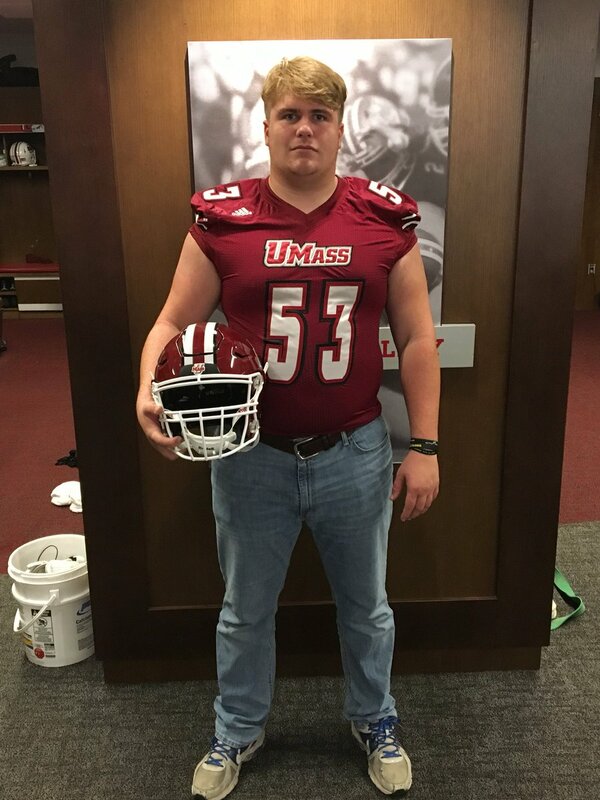 Parker Ogle, a 6-3 280 pound OG/C from Palm Beach Gardens, FL has Tweeted he's verbaled to UMass. I blogged about Ogle back on July 10th. Mike Traini of "Fight Massachusetts" has a post on Ogle's verbal to the Minutemen. Chose UMass over an offer from Bowling Green. Andrew Ford was released from the hospital Saturday night. He also Tweeted he's feeling OK and appreciated all the support he received. Mike Traini of "Fight Massachusetts" recaps the Minutemen's win. 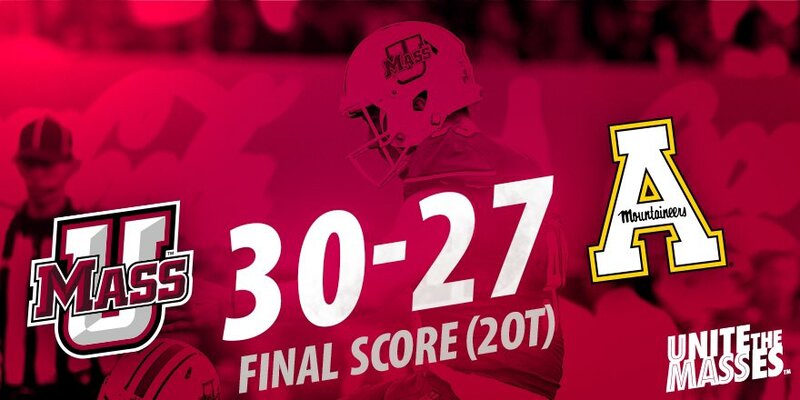 The Enterprise News reports UMass gets a win in double overtime. 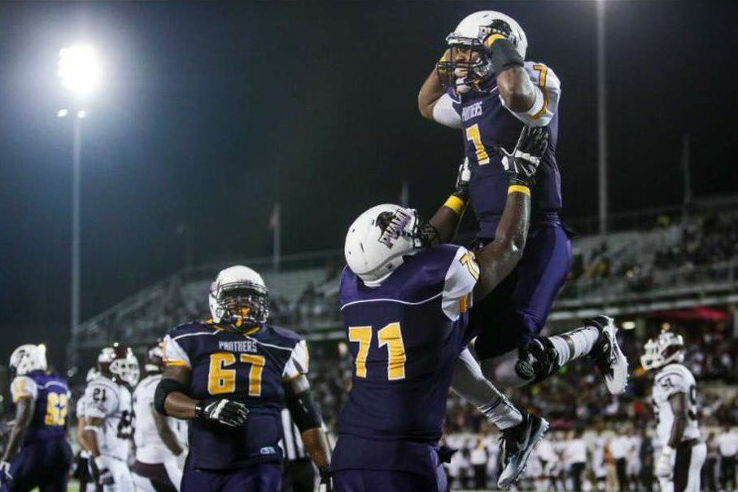 The Winston-Salem Journal says key penalties cost the Mountaineers in a double overtime loss. The Citizen-Times reports UMass clips Appalachian State in double overtime. There is no Vegas line yet on the UMass Mississippi State game because of Ford's injury. The Vegas Insider consensus line has the Bulldogs by 28. The Clarion Ledger looks at Mississippi State after their latest win (scroll down a bit till they get to some stuff on the UMass game). Note the Bulldogs get Alabama the week after UMass, so they might be looking ahead, just a bit. BYU fans are enjoying their first FBS win of the 2017 season. CBS Sports thinks coaches from Mississippi State and Appalachian State have a shot at being named HC at Florida. Can the readership help be out with a couple of questions? I didn't understand a couple of plays from Saturday's game. On the play where the Appalachian State kick returner muffed the catch and then ended batting the ball out of the rear of the endzone----why was that not a safety? He touched the ball in the field of play. Is possession required in order for it to be a safety? Then on the Ross Comis late hit. I thought once the play stepped out of bounds, the play was over and so the late hit was a dead ball foul. Then after that there were multiple fouls in the scrum resulting from the late hit. The officials initially said the foul on Comis would be enforced, but then offset everything. I though UMass should have had the ball 15 yards from where the late hit occurred and then offsets on both sides. ..
Best FBS win. Best win since Montana. The Minutemen set a lot "bests" in their win over Appalachian State, IMHO. Best defensive performance in FBS era. Yes, the wins UMass achieved so far have been mostly defensive grinds, but yesterday's performance was superb. The defense has two INT's. Two forced fumbles and 8 TFL. The Minutemen deserved to win on the defensive effort alone. Best kicking performance in the FBS era. Logan Laurant went 3 for 3 including a 45-yarder with five seconds left to tie the game. He then kicked a 36 yard FG for the first game-wining kick in memory. He had a career day. Take a bow, Logan! Best single offensive drive of the FBS era. With a minute fifty seconds left, Comis led the offense 53 yards to set up the game-saving field goal. We beat a league-leading FBS team. It was sweet. Kevin Dillon of MassLive says Logan Laurant won it in overtime. Dillon reports UMass rallied together after Andrew Ford's injury. Matty Vautour says Logan Laurant's clutch field goals gave UMass the victory. He also reports Andrew Ford's trip to the hospital seemed to be precautionary. The Boston Herald says UMass bounces Appalachian State in double overtime. The Charlotte Observer says the Mountaineers gave UMass the break it needed. The UMass Daily Collegians reports Andrew Ford's injury sparked the Minutemen to victory. Rotoworld says "break up the Minutemen". Hawaii lost to San Diego State 28-7. Coastal Carolina lost to Texas State 27-7. Old Dominion lost their sixth straight to North Texas. Tennessee lost to Kentucky. Tough year for the Vols. Ohio crushed Kent State 48-3. A new head coach did not help Georgia Southern as they lost to Troy 38-16. Mississippi State rolled over Texas A&M 35-14. Maine held William & Mary without a touchdown in a 23-6 win over the Tribe. BYU found its offense in a 41-20 win over 1-7 San Jose State. FIU remained in contention for the C-USA title with a win at Marshall. All right. UMass plays a very good Sun Belt team today. All the pundits picked the Mountaineers as the Sun Belt champion during the preseason. Seven games into 2017, Appalachian State is getting it done, tied for the conference lead at 5-2 overall and 4-0 in the Sun Belt. The Mountaineers are 2nd in total defense and 2nd in scoring defense. They lead the Sun Belt in sacks and 4th down conversions. They average 418.6 yards of offense. Appalachian State is a well rounded team. They can run and they can pass. They have a solid defense. UMass has scored 105 points in the last two games. We need to score points today. The Minutemen will probably need to score in the high 30's to win. I think we can do that. There will be much less of a margin for error against a good team like the Appalachian State. Let's put it together and get our second win. I'll be there, cheering for the Minutemen. Go UMass! Matty Vautour reports UMass had a short prep time for Appalachian State. The Boston Herald says UMass eyes a victory in its final game at McGuirk. UnderDog Dynasty predicts Appalachian State 35 UMass 17. The Winston Salem Journal reports the Mountaineers look to their young wide receivers heading into the UMass game. The Ashville Citizen-Times says Appalachian State looks to keep rolling against UMass. Boston College ran over Florida State last night 35-7. I think BC freshman AJ Dillon is one of the top backs in the country. 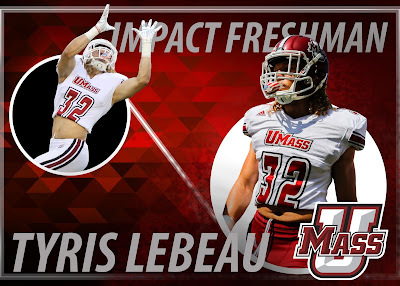 Too bad UMass could not have landed him. I know we recruited Dillon; he would have changed the program at UMass. Chris Joyce, a 5-11 175 pound athlete from Hampton, GA has Tweeted he's received an offer from UMass. This article from June 2017 features Joyce. 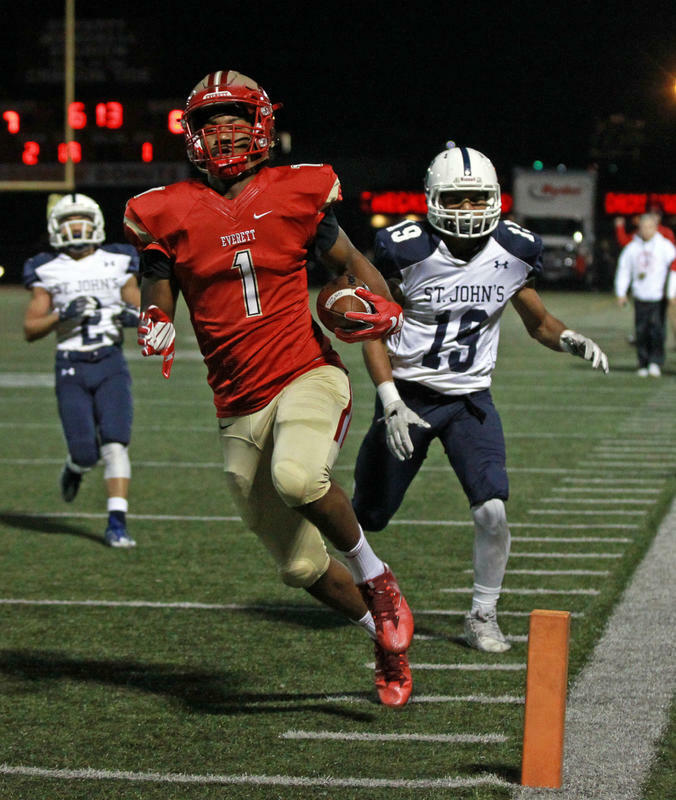 Joyce holds ten offers including FBS teams from the MAC and Sun Belt. The Mountaineers return six starters on offense and six on defense from a team that went 10-3 including a 31-28 victory over Toledo in the Camellia Bowl. RB Jalen Moore is a three-time Sun Belt offensive player-of-the-week he runs behind an OL that had three members first-team All-Sun Belt. QB Taylor Lamb has been setting program records in 2017. Most pundits had Appalachian State as the preseason Sun Belt Champion. They are currently tied for the conference lead with Arkansas State. As several blog commenters have pointed out App State's wins have come against less than stellar opposition. They lost to Georgia 10-31 and lost to Wake Forest by one point 19-20. Still, Appalachian State is night and day compared to Georgia Southern. This will probably be a shoot out. We need to keep our DB's in the game and not get injured. 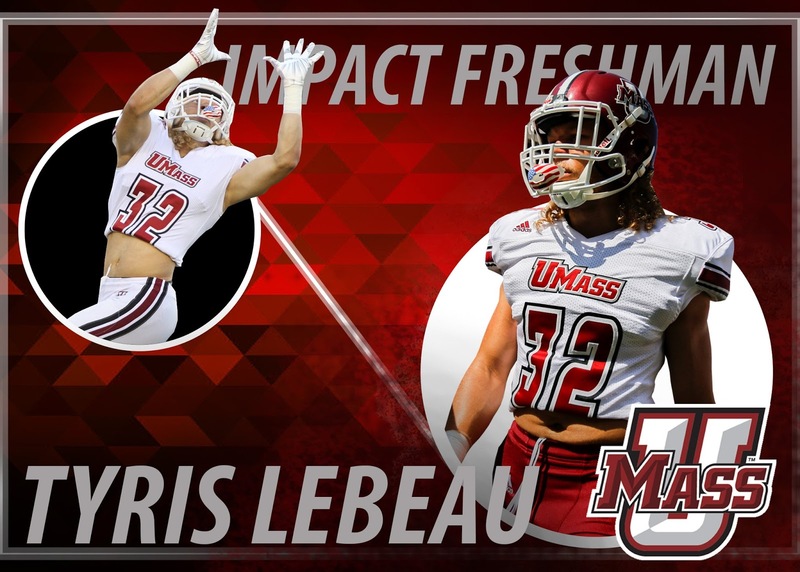 UMass needs Lee Moses, Isaiah Rogers and Jesse Monteiro in the game, not on the sidelines. I think the Minutemen will score in the thirties. Can we keep the Mountaineers to a lesser score? So far in the second Whipple Era we have been in a number of high scoring games, but have yet to win one. Mike Traini of "Fight Massachusetts" previews Saturday's game against Appalachian State. Kevin Dillon of MassLive reports UMass looks for its second consecutive win. Matty Vautour says the Minutemen look to build off their first win. High County Press says the Mountaineers could win "in a rout" and predicts App State 47 UMass 20. Metro USA reports UMass TE Adam Breneman takes a leap up in NFL draft position. Rivals.com says take the Mountaineers to cover the spread against UMass. SB Nation says take UMass to beat the spread against Appalachian State. 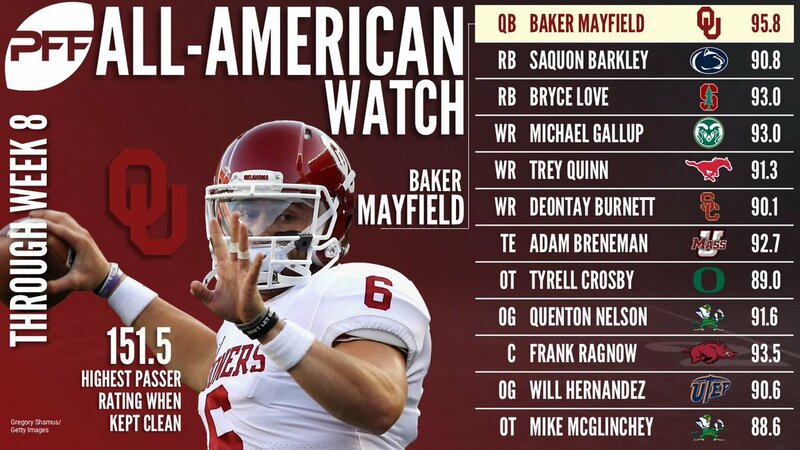 Athlon Sports predicts Mountaineers 30 UMass 17. This article features Mississippi State's OL coach John Hevesy, who originally was a three-year starter at Maine. BYU plans to be more aggressive against San Jose State. FIU features 15 seniors who are starters this year. Darien Green, a 6-0 214 LB for Cerritos, CA has Tweeted he's verbaled to UMass. Mike Traini of "Fight Massachusetts" has a post on his signing here. UMass was Green's only offer. 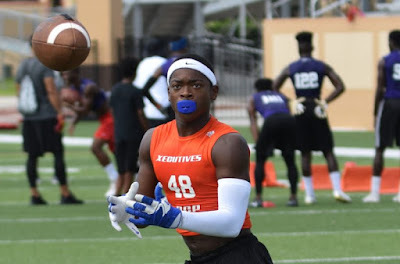 He was drawing interest from a mix of FBS and FCS schools. UMass has its game notes for Appalachian State up. Matty Vautour has a podcast discussing the Georgia Southern win plus other UMass sports news. Ryan Ames of the UMass Daily Collegian reports UMass hosts Appalachian State in the final home game at McGuirk. Mississippi State faces a tough road game against Texas A&M. The Bulldogs have one of the best offensive lines in the country. This article explains they are #1 in sack rate and also excel in run blocking. Mississippi State has been especially tough in Starksville, dominating at home. FIU goes into Marshall as a 17-point underdog. 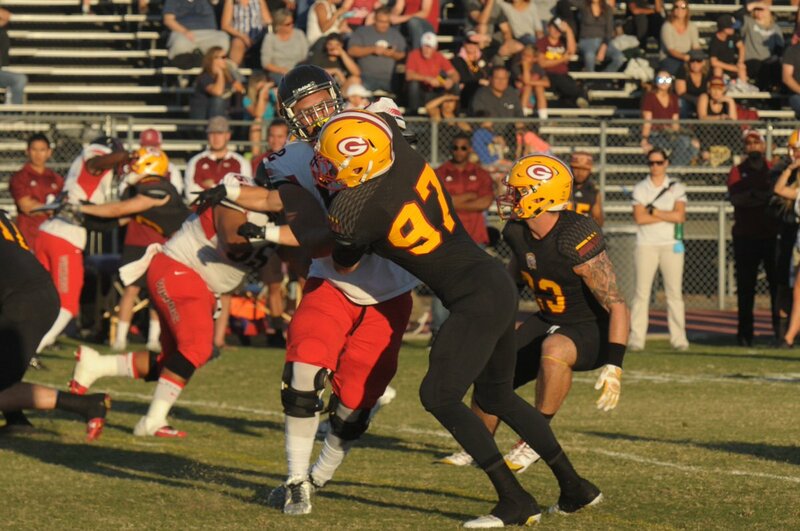 Jake Hudson, a 6-4 235 pound DE from Saddleback CC in CA has Tweeted he's received an offer from UMass. Hudson has six FBS offers including Toledo and Hawaii. Matty Vautour says McGuirk has been a special place for Adam Breneman. Philip Sanzo of the Daily Collegian says Appalachian State is the type of win UMass needs. GSU OC Bryan Cook liked what he saw of JUCO QB Kado Brown during last Saturday's game against UMass. Good News: UMass' win over GSU moved the Minutemen out of ESPN's Bottom Ten. The Bad News: we lost to the #6 Coastal Carolina. More on Appalachian State QB Taylor Lamb's record-setting day against Coastal Carolina. Lamb was named the Sun Belt's co-offensive player-of-the-week. More trouble for BYU as starting RB Ula Tolutau was cited for possession of marijuana. Keepers College Football ratings has issued his first power rankings for 2017. UMass is #119 (out of the bottom 10). His algorithm has UMass as a 4.66 point favorite over Appalachian State. Vegas Insider has the Mountaineers as a 3.5 point favorite. Matty Vautour looks at the Minutemen's chances for more wins this season. Two of Appalachian State's best players Jalen Moore and Devan Stringer have injuries and are "day-today" if they will available for the UMass game. The Clarion-Ledger says Mississippi State's strong win over Kentucky means the Bulldogs are capable of bigger things. BTW, the kickoff time for the UMass-Mississippi State game has been announced. Maine's defense has been strong over the Black Bears last two games. BYU finds glimmers of hope in a loss to 1-6 Eastern Carolina. As Matty Vautour points out in his article above, the FIU-Marshall game may have ramifications for UMass. The Herald-Dispatch thinks the second quarter is the key for the Thundering Herd. The Miami Herald report FIU wants to recruit more speed and also looks at the remaining games on the Pnathers 2017 schedule. Mike Traini of "Fight Massachusetts" recaps Saturday's win over GSU. Georgia Southern fired Tyson Summers after the Eagles lost Saturday. Remember, we got FIU's coach fired too. Kinda tough to fire a coach after 1.5 seasons, although GSU seemed to have multiple problems. During what little of the game NESN broadcast, the announcers said at one point GSU had players ejected for targeting for six consecutive games. That speaks to an undisciplined club. Savannah Now on Summer's firing. The Atlanta Journal-Constitution has fan reaction. UMass is up to #15 nationally in passing offense. The Minutemen's big rushing day against GSU moved UMass out of the bottom 30 in rushing yardage. UMass is a Top-30 team in passing efficiency. The Minutemen are #39 in total offense. After scoring 105 points in the last two games, UMass is scoring 29.9 points/game. From worst to first as next Saturday UMass hooks up with Sun Belt Conference leader Appalachian State . UnderDog Dynasty reports Appalachian State slugged its way to victory over Coastal Carolina. Tyler Lamb, App State's QB had a record setting game against the Chants. Appalachian State is focused on their passing game. Appalachian Online give grades for the Mountaineers win over Coastal Carolina. BYU fell to a weak 1-6 East Carolina team. The UMass fans at the game--- including me, stood and clapped at the end of a cathartic win over Georgia Southern. It was not a grind-it-out 27-24 win that I had hoped for. UMass broke out. 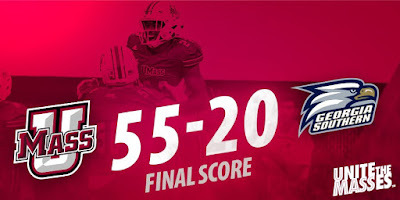 The Minutemen set offensive records. We had the biggest win margin of the FBS era. We forced defensive turnovers. There have been a lot of long somber drives back to New Hampshire in the Blog household. Last night there was joy for all UMass fans. Enjoy it. Minutemen fans earned it as much as the team did. UMass had 320 yards rushing with a 7.3 yards a carry. The defense held GSU to 3.3 yards a carry. 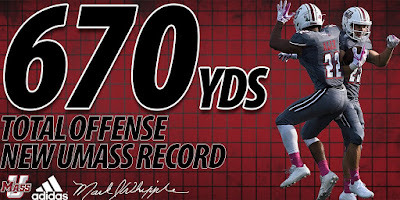 The Minutemen had an all-time 670 yards of offense. UMass did not give up a sack. GSU had it's third player ejected for targeting in two games. In further proof the stars were aligned, all three New England teams won: BC beat Virginia, UConn beat Tulsa and Rutgers even won a Big 10 game. Mark Chiarelli of MassLive reports a revised lineup and a first half blitz allows UMass to win big. Chiarelli also says UMass set program records despite some unusual personnel situations. Matty Vautour says a fast start sparked the first win of the season. Matty also reports Ross Comis and Andrew Ford drove the Minutemen to a win. The UMass Daily Collegian report UMass picked up a blowout win. Savanah Now says UMass dominated. SB Nation says it's time to fire Tyson Summers. The Enterprise News says BC and UMass cruise to wins. MDJ online reports UMass romps past mistake-prone Georgia Southern. UnderDog Dynasty says GSU moves to 0-6 after being drubbed by UMass. Fox Sports reports Bilal Ally and Ross Comis lead UMass past Georgia Southern. Appalachian State scored 20 unanswered points to edge Coastal Carolina. Old Dominion suffered their fifth straight loss. Temple lost to Army in overtime. Maine edged Albany by two points. The gloom in Provo deepened as BYU fell to 1-7. Well, today is the "Battle for the Bottom". The Minutemen have already lost to one dreadful team--Coastal Carolina. Losing to Georgia Southern would certainly cement our status as #130 on FBS. UMass can win this game. We need to score points and not miss scoring opportunities. With Georgia Southern's clock control offense, the Minutemen won't get a lot of chances. The defense needs to stop big plays. No blown assignments. No wide receivers open by 20 yards. If we win, UMass can get some momentum for the second half of the season. It's going to be a beautiful day weather-wise. I'll be there cheering for our side. Hope you will be too. Matty Vautour reports UMass will try to deal with GSU's option attack in a battle of winless teams. Savannah Now says winless UMass and Georgia Southern try to turn the corner. Joel Thompson of exTREMEal has live stream information on the Eagles-Minutemen game. 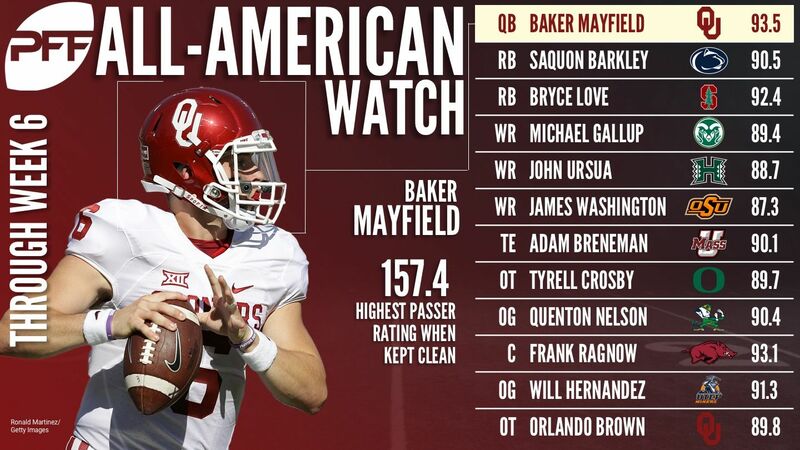 SB Nation looks for UMass to cover the spread. Athlon Sports predicts UMass 27-Georgia State 20. The Eagles return three starters on offense and four on defense from last year's 5-7 team. The Eagles have been having a terrible year. They run the triple option and have only been averaging 3.9 yards/carry. GSU has been averaging 17.60 points/game and giving up 38.60. One thing the Eagles do well is control the clock. They average about eight minutes more possession time than their opponents. UMass cannot have many three-and-outs as we won't get the ball back. On September 9th, New Hampshire beat GSU 22-12. UNH scored 15 points in the first quarter and led the entire way. GSU did hold UNH scoreless in the second half. I would feel better about this matchup if we had not played so poorly against Coastal Carolina. UMass gave up 6.8 yards/carry against a very weak option team. We can't do that against Georgia Southern. The Eagles are built to control the clock. They are not built to come back when behind. The UMass offense needs to score early and often. With GSU's starting QB Shai Werts questionable for the game, the Eagles may show some new looks. UMass has a full schedule of events for Homecoming weekend. I don't think I've linked to the Minutemen's game notes for GSU. They're here. Mark Chiarelli of MassLive wonders if the extra time off will help the Minutemen during the second half of the season. Matty Vautour says Georgia Southern brings memories, but no 2017 wins to McGuirk this Saturday. Mike Traini of "Fight Massachusetts' previews Saturday's game and predicts a Minutemen victory. The GSU site "Eagle Sports Insider" interviews Mike Traini about the UMass-GSU game. The George-Anne says it'll be "the war of the winless". MassLive reports Amherst will be busy this weekend with both UMass and Amherst College celebrating Homecoming. The former Lord Jeff's will unveil a new mascot. The Deseret News breaks down BYU final six opponents including UMass. 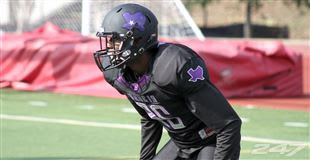 Brandon Perry, a 5-9 155 pound CB from Houston, TX has Tweeted he's received an offer from UMass. UMass is the first offer for Perry. Mike Traini of "Fight Massachusetts" chats with Eagle Sports Insider writer Justin Judy about Saturday's game between the Minutemen and GSU. Sports On Earth ranks all 130 teams at mid-season. UMass is #127. HCP Press.com previews Saturday's game between Appalachian State and Coastal Carolina and predicts App State 47-Coastal Carolina 7. Myrtle Beach.com report Appalachian State created the FBS model Coastal Carolina wants to follow. Fearless kick returners play key roles for the Maine Black bears. Meanwhile, FIU is tied for the best 6-game start in school history. Henery Pearson, 6-3 235 pound TE from Paramus Catholic in NJ has Tweeted he's received an offer from UMass. This article from August 2017 features Pearson. Besides UMass, Pearson has FBS offers from Army, Rutgers, Appalachian State and Marshall. Tyris Lebeau has gone 5-0 GP-GS 3 UT 5 AT 8TT on special teams. Georgia Southern has their game notes for UMass up. Savannah Now reports Georgia Southern QB Shai Werts is questionable for the game at UMass. If he is unable to go, then the Minutemen may be facing Labaron Anthony or JUCO transfer Kado Brown. 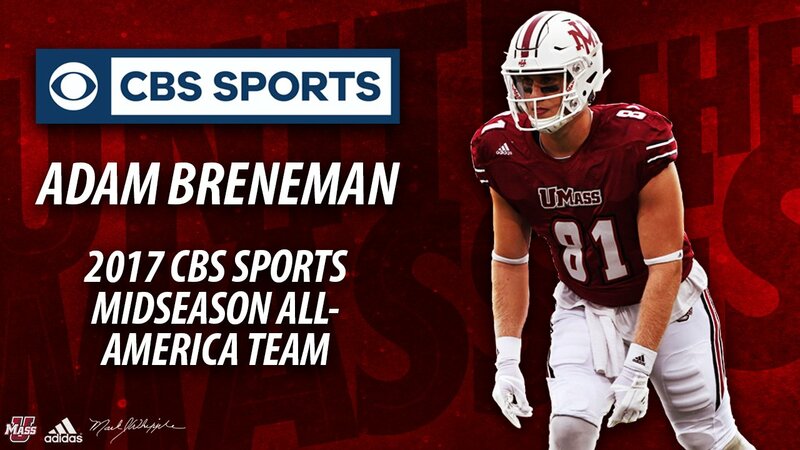 I dunno if this is good news for UMass or not. The Eagles offense has been terrible with Werts. Their passing game is heaving the ball down the field and hoping the defense will be caught cheating up to stop the option or a pass interference call. The Huffington Post has a story on college football at Fenway Park. The Salt Lake Tribune says BYU looks for life anywhere it can find it. Alabama is a 34 point favorite over Tennessee and SEC wonders just how bad it's going to be. Joshua Bowers, a 5-9 166 pound CB from Tarpon Springs, FL has Tweeted he's received an offer from UMass. This article from Prep Scouting Report features Bower. Also runs Track & Field. "At last week's Pinellas County Athletic Conference meet, Bowers ran an 11.03 in the 100 and a 22.27 in the 200, winning both." UMass is the first FBS offer for Bowers. Sports Chat Place previews the UMass-Georgia Southern game and picks the Eagles over the Minutemen. The Berkshire Eagle says Williams college made a turn around in football and so can UMass. Georgia Southern HC Tyson Summers says he's done too much micromanagement. GSU students hold a "Fire Summers" rally. SB Nation reports BYU has been college football's most disappointing team in 2017. Red & Black ranks the SEC including the two UMass foes Tennessee and Mississippi State. Temple aims to win six or more games. 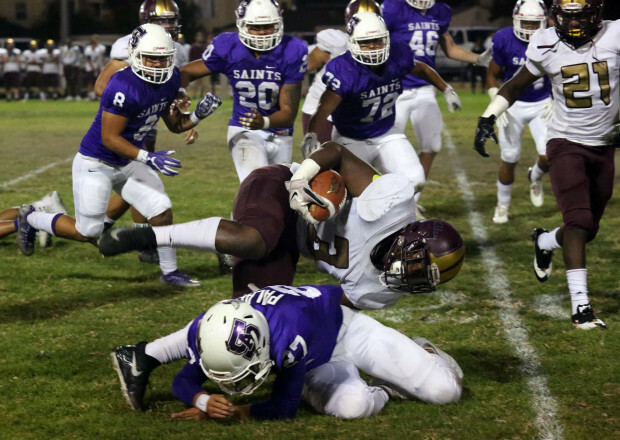 Holy Cross fires HC Tom Gilmore after the Crusaders dropped four straight to fall to 2-5. Dacoda Weaver, a 6-5 325 pound OT from Lakeland, FL has Tweeted he's received an offer from UMass. 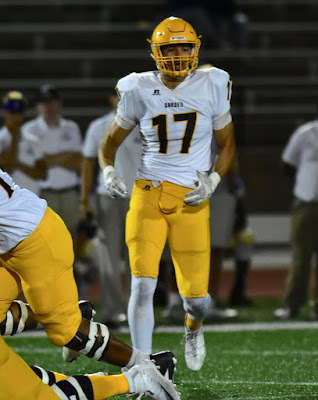 UMass is the first FBS offer for Weaver. UMass opens as a seven point favorite over GSU. Savannah Now reports Georgia Southern was down by one point in the fourth quarter and had the ball and a chance to win the game---and the stands were eerily quiet. The bottom four teams in passing yards per game are all option clubs. The Eagles are the best of the lot with 93.4 yards/game. Conversely, Navy, Army and Georgia Tech are 1,2 and 3 in rushing yards per game. Georgia Southern is #27 with 212.3 yards/game. The George-Anne says frustration is growing as the Eagles fall to 0-5. I watched the Mississippi State-BYU game on the SEC network yesterday. The Bulldogs looked like the real deal as they manhandled BYU. Mississippi State had a power running game (306 yards rushing) and added 240 more in passing. The Bulldog defense held BYU to eight first downs and 176 total yards. UMass is going to have their hands full in Starksville. At BYU, the Cougars are dealing with rock bottom. BYU feels "their backs are against the wall". BYU did bring off a social media sensation as the Cougar mascot "Cosmo" joined the Cougarettes dance team for a great routine. Well, Georgia Southern fell to New Mexico State 27-35 at home. That sets up the Bottom Bowl against UMass next week. I watched about half the game on ESPN3. The Eagles looked neither fast nor talented. In addition GSU had two of their defensive players ejected for targeting, including their leading tackler. I believe that means they will not be available for the first half against UMass. Safety RJ Murray and LB Tomarico Reese were the defensive players ejected. In addition, the Eagles QB Shai Werts was injured on the last play of the game. If we lose to the Eagles, we will be, officially, the worst team in football. Hawaii beat San Jose State to stop a four-game losing streak. Coastal Carolina was demolished by Arkansas State 51-17. 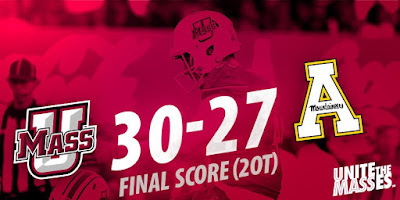 I still can't believe we lost to a team that would have finished 2-6 in the CAA. Old Dominion was routed by Marshal 35-3. Temple was upset by formerly punchless UConn 28-24. Tennessee dropped a defensive battle to South Carolina 15-9. Ohio pulled away late to defeat Bowling Green 48-30. Appalachian State had a 20-point comeback to defeat Idaho 23-20. Mississippi State ran over BYU 35-10. Maine crushed hapless Rhode Island 51-27. 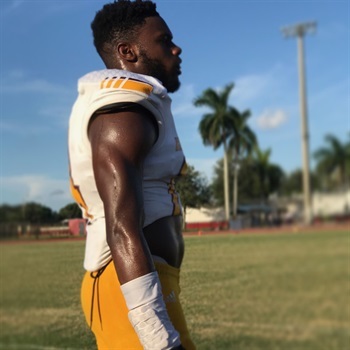 Back on August 11th, I blogged about Michael Nesmith, a 6-0 190 pound Safety/OLB from Hallandale, FL. 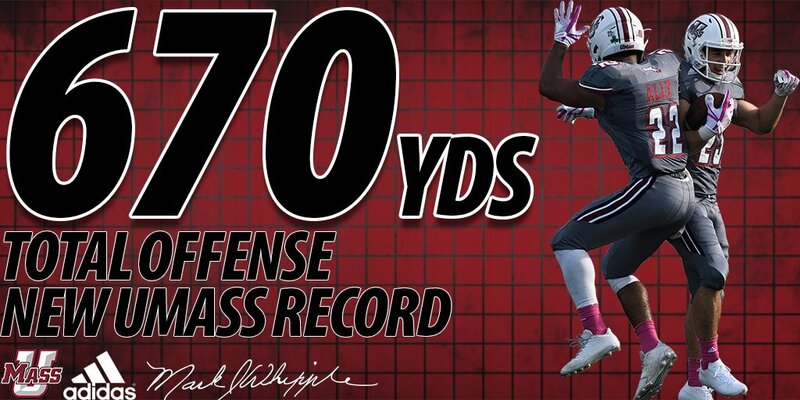 Yesterday, he Tweeted he's committed to UMass. Mike Traini of "Fight Massachusetts" has a post about Nesmith's verbal. 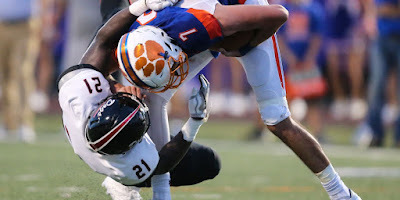 Hudl.com has some video from this fall's games. Ran a 10.70 100 meters in April 2017. Chose UMass over an offer from Akron. Hawaii looks to snap their losing streak against San Jose State. Coastal Carolina looks to break their four-game losing streak against 2-2 Arkansas State. Old Dominion plays Marshall in a match-up of strength vs strength. UConn looks to change their season with surprise victory over Temple today. Fox Sports expects a close game between Tennessee and South Carolina. Ohio needs a win today over Bowling Green to keep their hope of a MAC championship alive. Georgia Southern seeks their first win versus New Mexico State. Appalachian State looks to remain perfect against the Idaho Vandals. Mississippi State meets BYU in a battle of sputtering offenses. Maine looks for their eleventh consecutive win against Rhode Island. 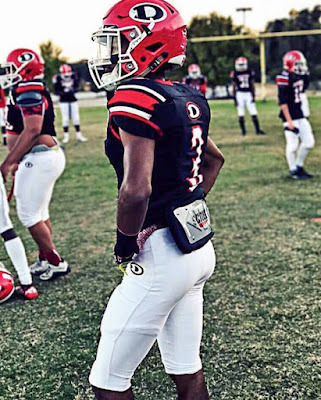 Back on October 10th I blogged about Marco Domio, a 6-2 190 pound DB from Houston, TX. 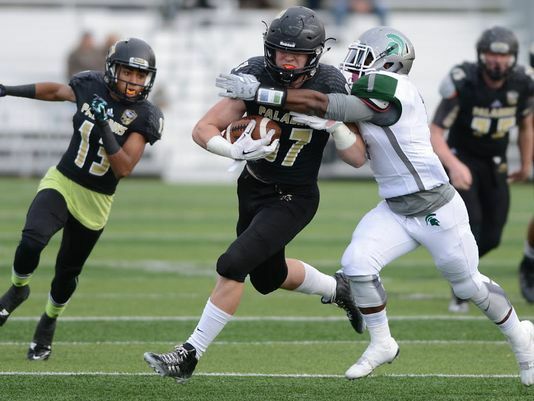 Mike Traini of "Fight Massachusetts" has a post about Domio and updates his recruiting interest from UMass. Some actual UMass Football News: Matty Vautour reports UMass will be back to full strength for Georgia Southern. Adam Breneman, Lee Moses, Isaiah Rodgers and Bakhari Goodson all return. Matty Vautour says UMass is working on defending Georgia Southern's triple option offense. Georgia Tech, Army and Navy run the triple option. They're 10-3 in 2017. How to defend the triple option with a 4-2-5 defense. The Georgia Southern-New Mexico State game will be on ESPN3. Underdog Dynasty previews this week's Appalachian State-Idaho game. Darian Green, a 6-0 214 pound OLB/RB from Cerritos, CA has Tweeted he's received an offer from UMass. 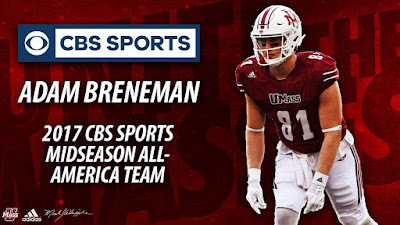 UMass is Green's first FBS offer. Matty Vautour Tweets most of the injured UMass players: Brenenman, Rogers, Moses have returned to practice. A Scout.com writer looks at Mississippi State's remaining games and thinks UMass will be an "underdog in every one of it's remaining games". Two UMass opponents play this Saturday and Mississippi State is wary of BYU TE Matt Bushman. The Atlanta Journal thinks the Bulldogs will respond in a big way against 1-5 BYU. Eleven days after the biggest win in program history, the Montgomery Advisor says Troy laid a "dinosaur egg" in a Wednesday night loss to South Alabama. I watched that game and both the Troy players and coaching staff looked hung over from the big win at LSU. The loss certainly put a big crimp in Troy's bowl ranking. 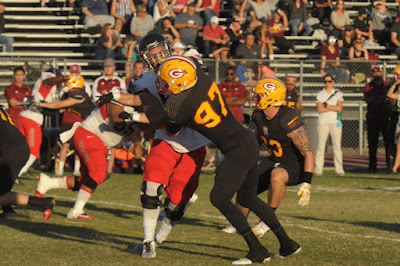 Nigel Kirby, a 6-8 250 pound TE from Garden City Community College has Tweeted he's received an offer from UMass. 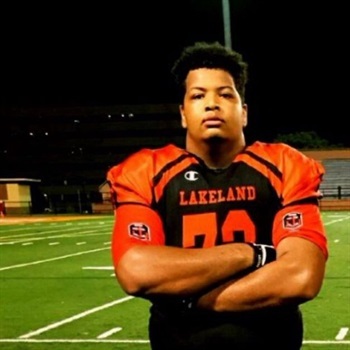 Kirby has eight offers including Bowling Green from the MAC and several Sun Belt schools. The Las Cruses Sun-News reports winless Georgia Southern still presents problems for New Mexico State's run defense. New Mexico State heads east to play GSU at Paulson Stadium. Appalachian State's Jalen Moore was Sun Belt offensive player-of-the-week. Moore had three games where he rushed for more than 240 yards. Tailgating at Appalachian State is a unique culture. An historic five-game losing streak sends BYU reeling into Mississippi State's Davis Wade stadium Saturday. 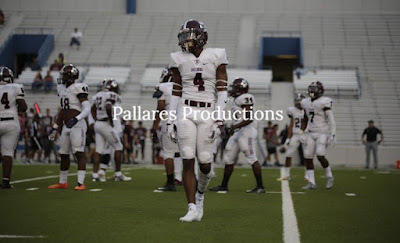 Marco Domio, a 6-1 190 DB from Houston, TX has Tweeted he's received an offer from UMass. 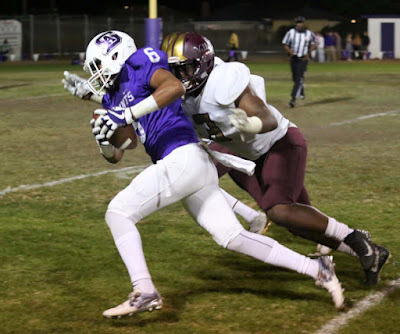 UMass is Domio's first FBS offer. The Knoxville News-Sentinel has 88 images from the UMass-Tennessee game here. Georgia Southern has been struggling with attendance with an 0-5 record. "MacDonald says buying season tickets and reserving a parking spot for the season costs him more than $2,000." An Eagles fan says the program is "in a state of sorrow". Georgia Southern is going to try new uniforms against New Mexico State. BYU is trying to stay positive during an historic losing streak. 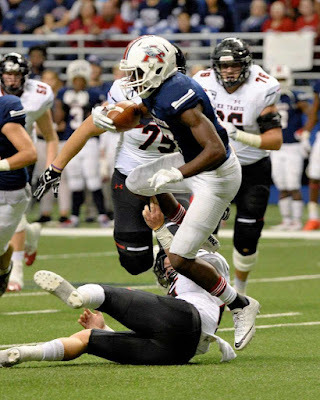 Alex Morris, a 6-1 188 pound Safety from Humble, TX Tweets he's received an offer from UMass. This article from April 2017 features Morris. Morris has 6 offers with UMass as the only school in the Northeast. After six games, UMass is #64 in total offense, #84 in scoring offense and #113 in rushing. Andrew Ford is #12 in passing yards. I forgot to report on FIU when I listed the UMass opponent's scores yesterday. The Panthers lost at Middle Tennessee 37-17. That brings FIU to 1-1 in C-USA. If the Panthers make the conference championship game, the December 2nd game against UMass is canceled. The State says Tennessee was in a "dog fight" against UMass. Two UMass opponents hook up next Saturday when BYU plays at Mississippi State. I watched the best college football game of last Saturday: Western Michigan's wild seven overtime win over Buffalo. In one of the overtimes, a Western Michigan TE caught a TD, then his sister ran onto the field and started hugging him. 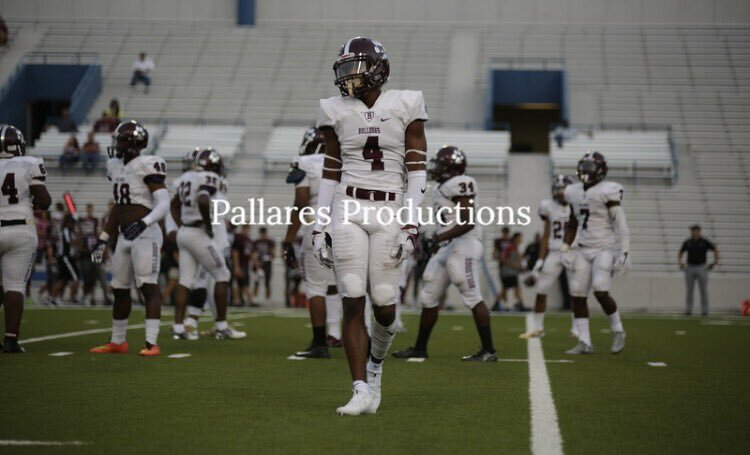 Bobby Wolfe, a 6-1 175 pound DB from Houston, TX has Tweeted he's received an offer from the Minutemen. Wolfe has nine offers including Power Five schools LSU and Baylor. UMass is the only offer from the Northeast. Hawaii lost their fourth straight with a 14 point defeat at Nevada. Coastal Carolina also lost their fourth straight, to Georgia State. Again, I can't believe we lost to the Chants. Old Dominion was crushed by FAU 58-28. Temple won 34-10 over East Carolina. Ohio lost to Central Michigan 23-26. Appalachian State had six INT's in a win over New Mexico State. Mississippi State had a bye. Georgia Southern and BYU lost earlier in the week.